This book was converted from Word to InDesign by our team and images were resized and optimised for ebook formats ePub and mobi. After testing on Kindle 1 and iPad 3 and making changes to satisfy our own quality standards and the author's preferences we published the book on Colquhoun's behalf on Amazon and Apple. 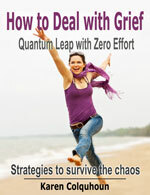 Win your battle with grief and anxiety. Using practical science, let’s use what smart people have already discovered and put together strategies that heal the body and brain from emotional trauma. What happens when a life-changing event takes place? What happens when an incident blows your world apart, leaving you nowhere to hide and facing the desolation of a broken heart?